I wrote about bookshelf organization for Cindy’s Weekly Wisdom this week, and I showed my friend Corinna’s living room book shelf. Here are photos of her ninth grade daughter Audrey’s color coordinated shelves, along with the letter Corinna emailed me explaining the hows and whys of the color coordinated books. The color book order is only about looks. We’ve just retrained our brains to visualize what a book looks like, and therefore what color it is, when we want to find a book. That’s actually easier than it sounds. It also reacquainted me with a lot of books I hadn’t looked at in a long time and helped me decide which ones to donate. How we came to display our books like this is fairly involved: The girls used to share a bedroom and our other bedroom was an office/guest room. When it was time for them to each get their own room, we had to incorporate a computer/desk area into our living room. I tried to do this in an attractive way by hiring a cabinetmaker to create the cabinetry and the floating shelves. And when those new shelves were installed, I just couldn’t put all our books up there without trying to do justice to the beauty of the shelves. The color thing was on a lot of design blogs like Apartment Therapy at the time. I also have books on another bookcase next to the TV. 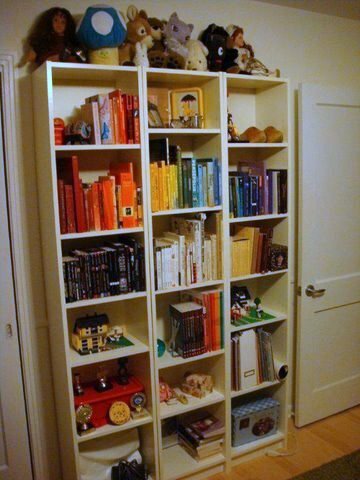 The color-ordered ones are mostly fiction, while non-fiction is in the other case. In terms of decluttering, I would say that color-ordering of books is only helpful in that it makes how the books look a priority, which can help in reducing the number. I have to edit the books every so often, because when new ones come in, old ones have to go out. I hope this is helpful – love the blog, btw! Love the last line. Thanks Corinna! Wow, Corinna’s bookcase looks like a piece of artwork. The color coordination is very relaxing to the eye! We’ve got our kids books organized by ‘size’ (height) and then by hard back, then soft cover. They are kept behind closet doors on one shelf, so that seems to work ok for us right now. The amount of books the kids actually own would only take up one of Corinna’s shelves. We don’t own any free standing shelving units (I can’t stand having to dust them!!! Also, when I have to look at them the visual clutter they evoke gives me a headache, probably that is why I adore what you’ve done w/ Corinna’s shelving unit!). We spent our American Thanskgiving on a European island (currently we live in Europe). I must share with you all, that on the flights to/from, I walked up/down the isle and did not see ONE single e-reader unit. Nor did I see ANY handheld gaming units (amongst the kids). Folks had REAL books, REAL paper and pencils, REAL cards to play games. On the beach and at the poolside, I also took note of what folks had for ‘entertainment’. NO e-readers to be seen, just books, some had small listening devices with music playing. Over-all, truly inspiring to NOT see handheld electronic devices! (we had our small laptop w/ us, but we used it only in the living room of the bungalow we stayed in). We relocate to the states next year, I think I’m in for a handheld electronics revolution shock, but I still refuse to get on that boat! I carried several paperbacks in my backpack during our trip. Kinda bulky and heavy, but I was ok with that. I could read them anywhere and didn’t need to worry if the ‘unit’ had enough juice to turn on! I love the photo. I would also love to see my husbands face if I suggested organising his books by colourcoding,lol. Your books do look very pretty though Corinna, thank you for sharing. My first thought when I saw the picture was “oh how pretty, but I’d never be able to find a book I was looking for.” Then, when you mentioned how “We’ve just retrained our brains to visualize what a book looks like, and therefore what color it is, when we want to find a book. ” I realized, I already do that. When I am looking for a book, I look for it by color in the midst of the other books. I have to laugh, I know a former college librarian who organizes her books by author. AGH! I would never be able to remember the names of all the authors of my various craft/hobby books!! But, you are right when you said we just need to “re train” your brains to look for the book by color. Yes – I’m very like this already, also. I always visualize the book when I think of it, so this would work for me, I think. Thank you everyone for the kind words; I was very flattered by Cindy’s request to share. Praise is certainly an incredible motivator to keep organized and to keep de-cluttering! I forgot to mention the funny reaction that Audrey had when I made the change to color-organizing: OMG – you’re breaking up the harry potters?! And then later she did it to her own books!